The MAG has curated a variety of tools available specifically to guide Duke researchers and clinicians. 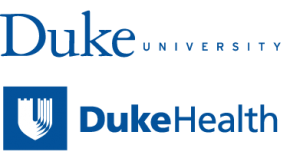 Duke Health and Duke University provide comprehensive branding guidelines for reference. The Global Digital Health Science Center aims to bring together experts from industry, policy, and science, to answer critical questions related to behavioral digital health science and to advocate for increased access to effective digital health interventions for the medically vulnerable populations, at home and abroad. Duke I&E provides various courses on entrepreneurship, an incubator, funding programs, and connections to the Durham start up community. The Duke Institute for Health Innovation (DIHI) promotes innovation in health and health care through funding and supporting high-impact innovation pilots and houses the Rapid App Prototyping service, which is run by Duke students. In September 2017, the Margolis Center brought together a group of experts from across the mHealth and healthcare ecosystem to identify the steps needed to advance the use of patient-facing mHealth data to support the evaluation of medical products. Through their partnerships with faculty, industry, entrepreneurs and investors, Duke OLV ensures that Duke innovations reach the marketplace for the benefit of society and to enable future investment in Duke research and innovation. They offer free consultation services. Duke Office of Clinical Research provides electronic consent for research studies through the use of REDCap. You can use eConsent to conduct and record consent for remote participants, or for participants in clinic on tablets or other touchscreen devices. Participants will be able to sign the consent form electronically with a stylus, mouse, or finger and submit it to the study team. Once the consent form is submitted, the participant will receive an email that includes a PDF attachment with a copy of their signed consent form. Need a place to build and test your mobile app or medical device? The lab offers a 14,000 square-foot state of the art laboratory, classroom and simulated clinical space that’s sits on the health system’s IT network. MEDx works to foster interdisciplinary collaborations between the School of Medicine and Pratt School of Engineering. The myRESEARCHhome portal, funded by Duke's CTSA, puts relevant applications, resources, and information specific to you and your projects at your fingertips. Your portal's content is personalized based on your researcher profile, showing you content you want and need to see, saving you time and effort. Find all the details about how to submit an app to the Apple App Store. This checklist brings together all of the criteria for a successful app submission to the Google Play Store. The FDA oversees the safety and effectiveness of many medical devices and therapeutics and provides oversight on mobile apps utilized as devices. This Federal Trade Commission resource can help app developers understand the different laws that may apply to apps they develop. FHIR® – Fast Healthcare Interoperability Resources – is a data standards framework created by HL7 for extracting patient information from the medical record. Duke is proud to partner with Medable, which is a DIY app development tool to create direct-to-patient research apps, deployable on Apple and Android phones. Curious if Medable is a fit for you? Check out their technical information. The Duke Health information security office recommends all applications abide by the OWASP Top 10, which represent the most critical security risks to web applications.